The exclusive range of surface mounted ceiling lights which we offer to clients are used in commercial and residential places. Attractive designs made up from best mix of different raw materials ranging from casted aluminum, steel, iron and glass. 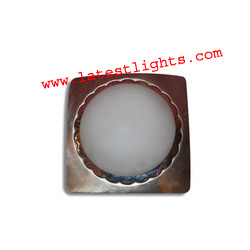 One of the hot selling designs, it combines the tastes of buyers looking for contemporary and elegant ceiling fixtures. Made from high quality steel, SLSC CF 002 is offered in various styles and sizes. The 100% customization facility which this model offers ensures that, these are extensively used by our customers and demanded for a number of applications. 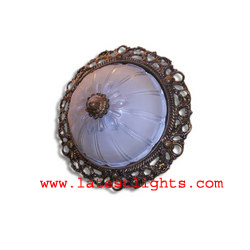 Ethnic and royal this surface mounted ceiling fixture is made from aluminum casting and is highly durable. SLSC CF 004 is a novel design where the reflector ensures maximum lighting output and an open front means a minimum effort for maintenance. The ability of using twin C.F.L.s means higher lighting output and higher energy saving. Available in different sizes and finishes.